‘Bharile’ in Konkani means stuffed. Okra is called Bhende. Stuffed okra or bharil bhende is one of my favorites from childhood. The okra available at our native is parrot-green in color and longer than the okra available here in US. Aayi uses the tender okras for this. She cuts the okra into 2-3 pieces (each piece is of the size of okra available here). She stuffs them and then ties them with a thread so that the stuffed doesn’t come out. These taste amazingly delicious. Only tender okra should be used for this dish. The dish requires a bit of patience to stuff and then fry them on a very low flame. Making this dish after a long time. So I decided to update the post with new pictures. Aayi prepared some stuffing for me and saved it. Making the stuffed bhindi was quite easy then. 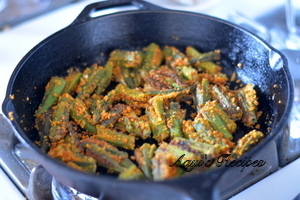 Stuff the bhindi and keep them on a hot tava with oil and fry on a low flame. Spicy okra stuffed with a spiced coconut powder. Powder it(powder should not be too smooth). Mix all the remaining ingredients (except okra). Remove the head (I didn't get a proper word here, so mentioned as 'head') of okra. Put some slits keeping the other side intact. Stuff them with the powder. Heat oil in a nonstick or cast iron tava. Keep the bhindis on it and fry on a very low flame. I too make stuffed bhindi on similar lines. 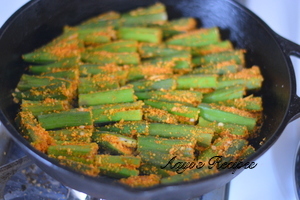 Hi Shilpa….Okra is my favorite since childhood days. The okra in native place is approx twice or thrice the size avble here, as you rightly said. Stuffed bhindi is my favorite. I roast the besan as Lakshmi mentioned abve. Thanks for sharing. Here is the link to my stuffed bhindi post..
this along with cucumber raita would qualify as my favourite summer food. i don’t put besan, but urs looks good. by the way, have a request for u. do u know the recipe for neer dosa and sukha chicken? How did you like my Satay , Shilpa? Good looking Bindhi Fry.I will try this method soon. Thanks for sharing. Nice arrangement of the okra.. looks very nice.. thanks for the recipe. 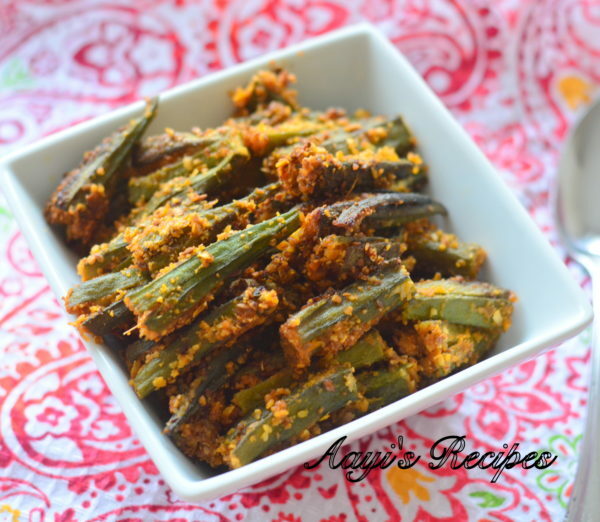 Hi Shilpa,One of my fav recipes and that too stuffed bhindi…simply delicious.thanx for sharing. Sorry for tempting you with chicken, Shilpa! Didn’t know you have stopped eating chicken!! I will post a beans recipe shortly as I told you before..
About kids lunches, I know sandwiches. Sweets and chocolates are not a good idea since they get hyper in school in my opinion. But I could send some recipes if you like about muffins and stuff.Give me an idea what do you expect since home cooked food in NC schools are not encouraged and my kids either eat at school or pack ham and cheese!! I tried your date cake……and I must warn your readers that its a lip smacking and addictive creation. I’ve never had eggless cake that tasted so good. I’m gonna bake some for my neighbors and friends now. Thanks for the recipe! Lakshmi, Aruna, I will try with roasted besan next time. Thanks. Thanks Arjuna for the link. I read your recipe, only difference between the two methods is coconut. As you know, we Konkanis can’t live without coconut :). Shaheen, I will search for neer dosa and chicken sukka. If I could get hold of it, I will surely post it. Thanks Preeti. I am happy to know you liked the cake :). Asha, Actually I want to try your satay recipe with something other than chicken. Fish may be?? i have decided to cook all chicken dishes with ‘soya chunks’ hereafter (but I have to forget about the dry dishes as soya might not fit there). Hey, you can give any idea about the lunchbox. Since I don’t have kids yet, my knowledge in this matter is zero. That post was to help my readers who have schoolgoing kids. It would be great help to me as well in future. Please leave your suggestions here or write a post in your blog and leave the link. I just want to know what you give in lunchbox, it might not necessarily cooked at home. he shilpa…was wondering if this dish can be made with fresh coconut? is it enough if i fry the coconut till brown and then use it in the stuffing? Dhivia, yes, if you don’t have dry coconut, you can use fresh coconut, but make sure to fry it well. The stuffing should become very dry. Add lemon juice and mix after you take off the flame. Feel that the 3/4 cup coconut is too much perhaps – i used 1/3 cup and still had some masala powder left over. Hi…was just browsing this site and now I have saved it as my fav. I am konkani too and currently residing in Australia…dont get that good variety of fresh Indian veggies here…will try this stuffed bhindi today as okra is my fav. will have it with roti…thanks for all these yummy recipes. to be honest i didnt like ur receipe.coconut is not giving nice taste. Shilpa, i think the coconut masked the taste of okra when i tried! Hi, i tried this 2day. believe me, this is one of the most awesome things i’ve ever tasted. & it’s so easy. in fact the masala can be prepared & kept in the fridge & used as & when required. thatz exactly what i’ve done. stored the leftover masala in the fridge 4 another day. thanx for the recipe. instead of besan, you can try corn flour(deer Brand), it is very crispy, not consuming much oil.for yr information, i always use corn flour. Delicious … these were another one of by cravings when i was pregnant in Copenhagen. This recipe was such a relief. Another bonus my husband (he is american) hates okra till he started eating it like this and of course when mum makes it manglorean style with coconut called bhende ajadina. I also stuffed tiny round eggplants like this and it is delicious. yummy! makes a different look to okra. 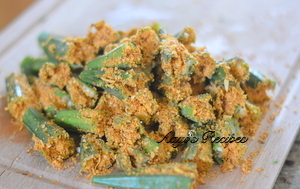 I had first time to tried to make this type recipe .Its really good in taste and colorful.I loved it.Thank you for sharing such a different type of okra recipe. Very nice recipe! Will try this in summer when Bhindi is easily available! thanks!